Compact portable multigas analyser, capable of measuring up to eight flue gases in a range of combustion and emissions processes. Lancom 4 delivers the complete solution for portable flue gas analysis, integrated into a compact battery-powered unit able to measure up to eight gases simultaneously with nine separate sensors. Simple to set-up and easy to operate, Lancom 4 enables highly accurate spot and semi-continuous gas testing adaptable to a wide variety of applications – ensuring your plant maintains full compliance with safety and emissions requirements. Customisable to specific gas measurements and process stream conditions, a resilient stainless steel probe extracts the gas sample while advanced real-time processing techniques produce the highly accurate combustion and emissions calculations you need. Easy to service and maintain, Lancom 4 is the ideal choice for industries burning coal, natural gas, oil or biomass, including applications in Glass, Power Generation, Hydrocarbon Processing, Natural Gas Compressor Stations , Minerals and Industrial Boilers. Power up Lancom 4 and be ready to measure in minutes. Supported by automatic zero calibration and continuous system diagnostics, excellent analytical performance is maintained throughout a long-life eight-hour battery charge. All major flue gases are monitored, including oxygen, carbon monoxide (low, H2 compensated, high), sulphur dioxide, nitrogen oxides (both NO and NO2), carbon dioxide, hydrogen sulphide, and hydrocarbons. The standard probe is suitable for most applications and is available in lengths from 0.3 m (1 ft) to 3 m (10 ft). High-temperature and DrySampler probes are available for the most challenging conditions. Optional probes allow Lancom 4 to measure smoke spot number and flow velocity. Data is displayed on the intuitive multi-language interface. An internal data logger stores your measurements for analysis, and data can be imported directly into any spreadsheet. or viewed using the free Insight data acquisition software system so you can make process decisions with more confidence, more quickly. Lancom 4 is AMETEK Land’s complete analysis solution for portable flue gas analysis. Power Supply: 95-265 V AC, 50-60 Hz, 30 Watts. Battery, rechargeable lead-acid (internal). *Calibration per ASTM D-6522 or LAND factory procedure. **True measurement if sensor fitted (calculated if not). ***Reduced to ± 25 hPa / 10’’ Water Gauge when used with flow probe. #Operating at maximum possible range may affect sensor life and accuracy. 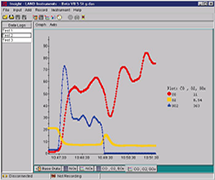 PC data acquisition software for direct logging of stack emissions measurements from Lancom 4 portable gas analysers.